Creating shelterbelts, enhancing native vegetation, removing weeds, reducing erosion. Land owners are supplied with native plants local to the area, mats, guards and stakes. 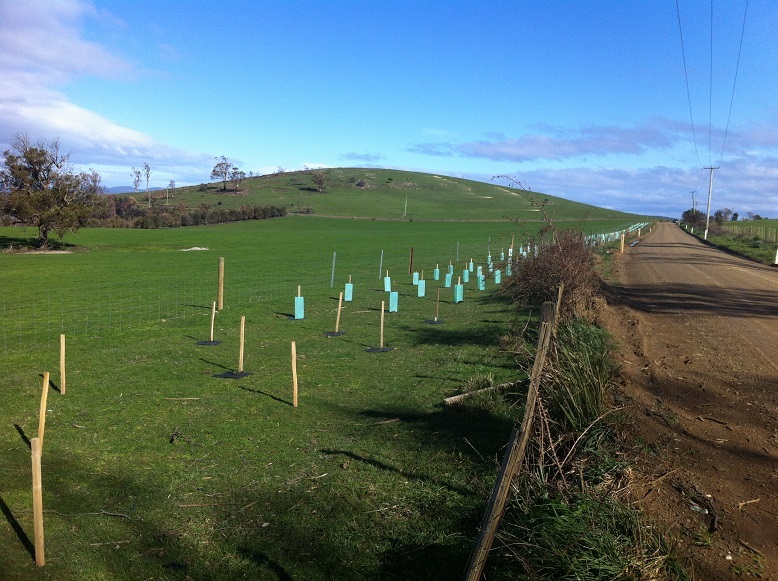 In return the land owner sets up any fencing required, plants all the trees and also maintains them into the future. Many thanks go out to Dave and Zoe at Froghollow Nursery, Saltwater River, and Andrew and Helenka at Wildseed Nursery, Sorell, who grow native plants for the Tasman Landcare Group and provide appropriate advice on species selection for the land owner. Tasman Landcare Group run this program through various funding sources. We aim to keep this an open and accessible annual long term project. Initially starting as part of an Australian Government funded project, the group now applies for small grants when available and has been utilising their fund raising activities.